FILE - A man walks by the Olympic rings with a sign of 2018 Pyeongchang Olympic Winter Games, in Pyeongchang, South Korea, Feb. 3, 2017. Mixed messages from the United States and concerns of a North Korean provocation could undermine South Korea’s plans to use the upcoming PyeongChang Winter Olympics to further peace and reconciliation efforts. On Sunday, Nikki Haley, the U.S. Ambassador to the United Nations, said in an interview with Fox News that the full U.S. Olympic team would participate in the winter games to be held in South Korea in February. However, she again left open the possibility that heightened security concerns could force the U.S. to reconsider this commitment. Haley said, "We always look out for the best interests of United States citizens." Last week Haley said U.S. participation was an “open question” due to high tensions with North Korea over its continued missile and nuclear tests. 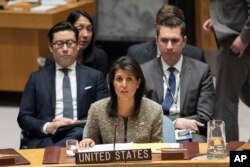 Nikki Haley, U.S. ambassador to the United Nations, speaks during a Security Council meeting on the situation in North Korea, Nov. 29, 2017 at United Nations headquarters. The White House and State Department have both expressed unqualified support for sending the full Olympics team and delegation. White House press secretary Sarah Sanders wrote on Twitter Thursday, "The protection of Americans is our top priority and we are engaged with the South Koreans and other partner nations to secure the venues." But Haley’s equivocal comments reflect increasing anxiety the U.S. nuclear standoff with North Korea could mar the games. H.R. McMaster, President Trump’s national security adviser, recently said the potential for military conflict between the U.S. and North Korea is “increasing every day,” as the Kim Jong Un government’s efforts to develop a nuclear intercontinental ballistic missile (ICBM), able to target the U.S., constitute an unacceptable security threat. North Korea’s Foreign Ministry said that U.S. and South Korean large-scale military drills conducted last week made the outbreak of war "an established fact." On Monday, Japan joined the U.S. and South Korea in two days of missile tracking drills. Officials in Seoul have opted to focus on the reassurance of Olympics participation offered by the White House. "President Trump has said the U.S. team will participate in the PyeongChang Olympics in a phone call between two heads of South Korea and the U.S. on November 30th. Also, he promised to send high-level delegation during the Olympics," said South Korean Unification spokesperson Lee Eugene on Friday. 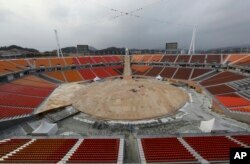 The Pyeongchang Olympic Stadium is under construction in Pyeongchang, South Korea, Nov. 25, 2017. But South Korean newspapers on Monday voiced alarm that the U.S. might withdraw from the Olympics, especially after the International Olympic Committee banned Russia from participating over state-sponsored athlete doping violations. South Korean President Moon Jae-in has emphasized that the PyeongChang Olympic Games should be an “Olympics for Peace,” and his government has been urging North Korea to participate, to both insure there are no provocations during the games, and to help ease regional tensions. The North Korean Olympic Committee missed the Oct. 30 deadline to register for the winter games, but the International Olympic Committee has indicated it is still not too late. Figure skaters Ryom Tae Ok and Kim Ju Sik are the only North Korean athletes to qualify for the Olympics so far. “If North Korea decides not to participate and relations between North Korea and the U.S. worsen, it is possible North Korea may disturb our glorious event by provocation,” said Ahn. In the last two years, North Korea has conducted numerous missile launches and three nuclear tests, despite facing increasing international sanctions for its provocative actions. After a long range Hwasong-15 missile test in November, which reportedly reached an altitude of 4,475 kilometers and flew 950 kilometers, Pyongyang claimed it successfully reached operational ICBM capability. 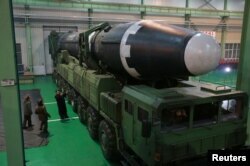 But the U.S. and South Korea dispute the operational aspect of this claim and expect further tests in the future.